Coatesville & Downingtown Dentist. World Class Smiles One Person at a Time®! Last updated August 5, 2016: When you visit our Thorndale dental office, your smile is our top priority. 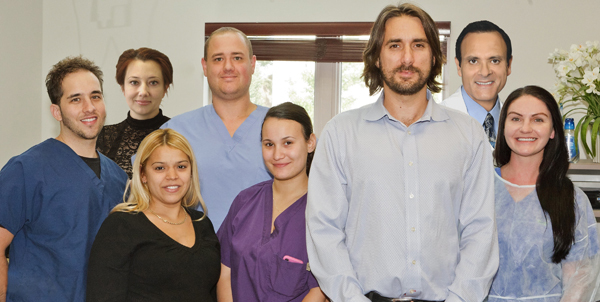 Dr. Mark Simeone and his entire team are dedicated to providing you with the personalized, gentle care that you deserve. We are located right across from the High Point water tower. Part of our commitment to serving our patients includes providing information that helps them to make more informed decisions about their oral health needs. This website is a resource we hope you’ll find both useful and interesting. Please let us know what you think!! Contact us or book your appointment online today! We genuinely hope this site is helpful to you in learning more about our practice, dental conditions and treatments, dental recommendations, and more . We have plenty of information and videos on dentistry, implants, cosmetic dentistry, veneers, teeth whitening, teeth bleaching, and Invisalign clear adult braces. Please browse through our website and be sure to give us a call if you have any questions or would like to schedule an appointment. Please visit our Invisalign page for more information on clear adult braces. Proudly serving Coatesville 19320, Thorndale PA 19372, Downingtown PA 19335, West Chester PA 19380, Parkesburg 19365 Honey Brook 19344 Exton 19341 with Cosmetic Dentistry, Invisalign Dentist, Emergency Dentist, Lumineers, Veneers, Night Hours, Weekend dentist, sleep dentistry. Chalfont Dentist, Dr. Mark R Simeone is a professional dedicated to Excellence in General, Family, & Cosmetic Dentistry such as Dental Makeovers, Porcelain Veneers, Teeth Whitening, Crowns/Caps & many other dental procedures. Please come and visit Chalfont Dentist, Dr. Mark R Simeone.